They're in the band! 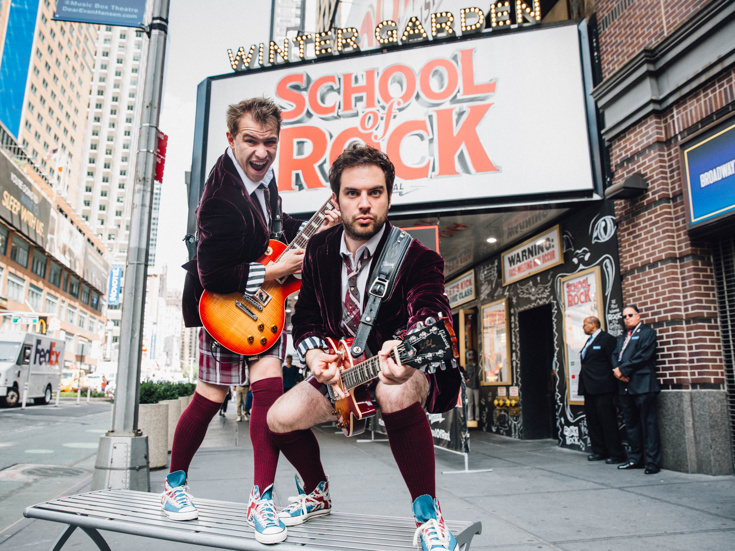 Justin Collette, who is School of Rock's current Dewey Finn alternate, will take over the role's five-show-per-week slot on September 25, while ensemble member Conner John Gillooly will become the role's alternate, playing the musical's three matinees. The show has announced that its longtime star, Eric Petersen, will rock out one last time in the hit show on September 24 before debuting the new Broadway musical Escape to Margaritaville. The current company of School of Rock also includes Jenn Gambatese as Rosalie, Becky Gulsvig as Patty and Steven Booth as Ned. Based on the film of the same name, School of Rock tells the story of wannabe rock star Dewey, who poses as a substitute teacher at a prestigious prep school. When he discovers his students’ musical talents, he enlists his fifth-graders to form a rock group and conquer the Battle of the Bands. Directed by Laurence Connor, School of Rock has a book by Julian Fellowes, music by Andrew Lloyd Webber and lyrics by Glenn Slater. The show features choreography by JoAnn M. Hunter, scenic and costume design by Anna Louizos, lighting design by Natasha Katz and sound design by Mick Potter.